:The church of today did not appear on the earth fully formed but developed over the centuries through historical events that, while they may seem distant, have a direct effect on our everyday lives. Following Jesus's command to spread the gospel to the ends of the earth, the apostles and their spiritual descendants have grown the church through times of peace and times of war, through persecution and pilgrimage. The church that began as a rag-tag group of Middle Eastern fishermen, tax collectors, and zealots became the multi-ethnic, multifaceted church of today. Now thirty of those course-altering events are brought to life by consummate storyteller Alton Gansky. Spanning twenty centuries of history, this lively book will entertain and educate readers who love history and who want to know why the church is the way it is today. 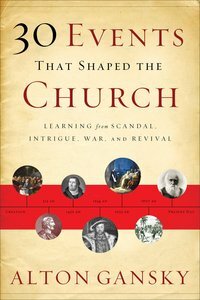 About "30 Events That Shaped the Church"